All happy summers should include happy summer drink pairings. This year, we’re recommending food pairings with sangria to help keep you filled up and cooled down during those hot Boston summers. Why we like sangria food pairing: It’s always trendy. Plus, it’s a bit more unique than the typical beer-and-BBQ on which many of us overdose throughout the summer. Tapas and sangria are a large and delicious part of the Spanish culture. Sangria, named after the Spanish word “sangre,” meaning blood (in reference to the typical dark red color), is frequently and famously paired with tapas, or “caps.” Tapas are similar to small appetizers and meant to accompany drinking—and thus minimize the amount of people stumbling home from Spanish restaurants and bars at the end of the night! 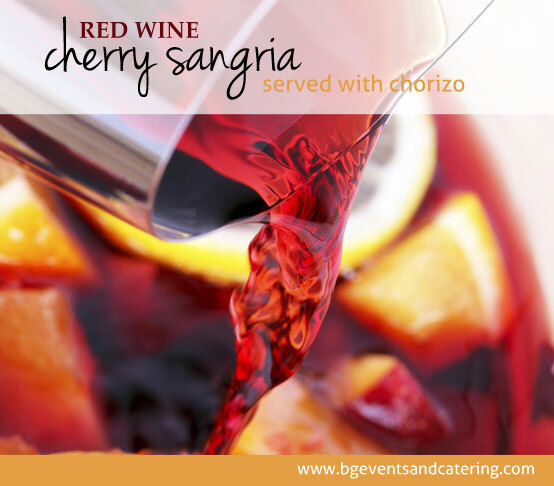 This spicy sausage tapa pairs well with this cherry and Tempranillo sangria recipe. Pour the wine into a large pitcher. Add sugar and stir until it dissolves. Mix in brandy, triple sec, peach schnapps, orange juice and cherry juice. Add the star anise and vanilla bean. Add sliced fruits to taste. Remove the star anise and vanilla bean. Albondigas, or spicy meatballs, pair with the fruitiness of this most common red wine sangria recipe. Pour the wine into a large pitcher. Squeeze in the juice from the lemon, orange and lime wedges before adding the squeezed wedges to the pitcher. Mix in pineapple (with juice from can), sugar, orange juice and triple sec. Before serving, add raspberries and ginger ale. Fried squid, like most seafood, couples well with white wine, and thus is a perfect match for this Albarino sangria recipe. Pour the wine into a large pitcher. Squeeze in the juice from the orange, lemon and lime wedges before adding the squeezed wedges and sliced apples into the pitcher. Stir in sugar, cointreau and brandy. Jamon Iberico is often referred to as the world’s best ham, and like other ham recipes, it goes great with this apple cider sangria recipe. Pour wine and apple cider into a pitcher. Add apples, pears and brandy. Before serving, add club soda. *Mixing tip! Less is more when it comes to the already sweet drink, sangria. Sugar, in all of these recipes, is optional and should always be mixed to taste. For more great summer beverage pairings, visit our Summer Beverage Pairings Pinterest board!